The Catavino Virtual Tasting for April closes today. This month I've had three wonderful rose wines, and I concluded with this bright pink beauty from the Rioja. One of the reasons Gabriella came up with this tasting theme was that she wanted to compare Spanish roses with those from other regions and I can report that based on my experiences Spanish wines are different. But they're different in an intriguing way that surprised me. Briefly put, the Spanish wine that I had seemed to be much more reflective of the place where the grapes were grown and the wine was made. It was less about indefinable pink fruit, and more about the soil and the growing conditions. In this case, that means the limestone vineyards of the Rioja. Located on the north-west coast of Spain, this area has maritime influences, a warm Mediterranean-type climate, and rocky soil. 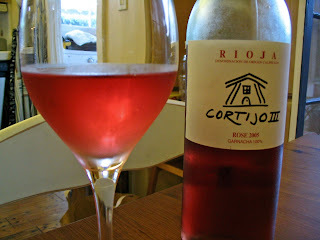 The 2005 Cortijo III Rose ($9.99, Beverages and More) managed to capture each of these essences. The wine was an extraordinary bright rose pink (which I understand it typical of roses from this region) and had a briny, sea-air aroma upon first opening the wine with the merest hints of fruit around the edges. When you sipped it, the first taste you came to terms with was stone, and then raspberry. Both were wrapped up in a steely, bone dry package. Made with 100% Grenache grapes, which are usually sweet and fruity when in red wines, in a rose these characteristics were much less in evidence. Still, it did have a kind of tannic edge which would, I think, make this wine popular with red wine lovers who don't usually like rose, as well as those who prefer wines that are less fruit-forward. Excellent QPR. We had the wine with a Mediterranean-inspired scallop dish that combined seared shellfish with pasta, orange, mint, and olives. It was delicious, and brought out the sea-air tang of the wine. As a cold pasta salad, it is perfect for taking out onto your balcony, deck, patio, or terrace and enjoying along with a cool rose wine. A big thanks to Gabriella and Ryan at Catavino who dreamed up this event and were our fearless leaders. Check out all the rose reviews that have been posted over in the rose forum. FYI: they are much more interesting than those in the latest edition of Wine Spectator! Here's the latest in my Friday posts highlighting California family wineries. You might not be familiar with all of them--yet--but they produce wines that speak with the voices of this state's people, places, and history. They are worth seeking out. These posts will be longer than most posts on the blog, but I hope you will find them perfect for leisurely weekend reading and internet browsing. Have fun! To read previous posts in the series, click here. Do you remember your first Vinum wine? I do. I was heartily sick of over-oaked Chardonnay and a wine merchant in Davis, CA suggested I try Chenin Blanc. It was 1999 or 2000. There was a lot of Chardonnay around. A lot. Chenin Blanc? Who had heard of such a silly idea? I think I rolled my eyes. He handed me a bottle with a label bearing the picture of two guys hitch-hiking near Clarksburg with a sign that said "Will Work for Chenin." That was enough to get me to take the wine, and as I was checking out the guy at the store said, "They're Aggies, you know." At home, when I opened the wine on a hot, hot Davis day capable of searing the flesh inside your nose (UC Davis alums will instantly know just what I mean), I thought I was in nirvana. Leave it to two Aggies to come up with the perfect summer wine. It was cool, crisp, and refreshing. I was sold on Chenin, sold on Vinum, and became a life-long fan. I was not alone. Friends started boasting that they were members of the "ABC" club (Anything But Chardonnay) after tasting their first Vinum Chenin Blanc, too. I give UC Davis alums Richard Bruno and Chris Condos a lot of credit in the transformation of the American palate. 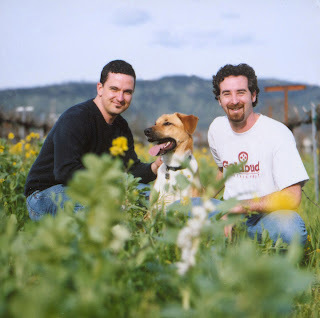 (photo of Chris, Jack the dog, and Richard courtesy of Vinum Cellars). Since the first 1998 bottling of Vinum CNW (Chard-No-Way) Chenin Blanc, they were leaders in showing US drinkers that they didn't need to drink oaky wines all the time. The two decided to start Vinum Cellars based on friendship and their mutual love of not only chenin blanc, but other once obscure varietals. Their first bottle of Mourvedre, for instance, also dates back to 1998, along with their first bottle of Cabernet Franc. We take these varietals a bit for granted now, but in the late 1990s--they were revolutionary. Today Richard and Chris work with family growers from Clarksburg to Santa Barbara, and from El Dorado County to Napa to make their fun and affordable line of wines, following in the footsteps of the negociants of Europe. They buy fruit from specific growers, overseeing the production themselves, and then marketing the resulting wines under the Vinum Cellars label. 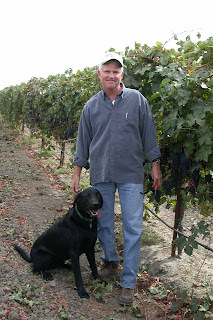 Ken Wilson (pictured at right with his beloved and famous dog, Tanker from the PETS Petite Sirah label, courtesy of Vinum Cellars), is one of those growers, and his family have been raising grapes in Clarksburg since the 1920s and have been growing wine grapes since 1971 when they planted their first 15 acres of Zinfandel grapes. Just 15 minutes from downtown Sacramento, today Wilson Vineyards grows over eight varietals for Vinum and other winemakers in California. 2006 Vinum Cellars Chenin Blanc CNW (Chard-No-Way). ($11) From the Wilson vineyards in Clarksburg comes this very good chenin blanc, with a nice balance between bright citrus and soft melon flavors and aromas. A slightly silky texture makes this wine distinctive and elegant. Excellent QPR. 2004 Vinum Cellars Cabernet Sauvignon "Slow Lane" ($27). This is an excellent value in a Napa Valley cabernet. Warm aromas and flavors of cocoa and cassis are dusted with cinnamon, and these flavors develop throughout the long, juicy finish. Pull out the steaks, fire up the bbq. Excellent QPR. 2005 Vinum Cellars Petite Sirah PETS Wilson Vineyards ($14). The wine with Tanker on the label, this is another great Clarksburg wine from Ken Wilson's fruit that's slightly rustic in style, with brushy and herbal aromas and flavors, accompanied by red currant fruit. I'd be tempted to see how this wine would be in the fall, when it has a chance to settle down a bit since it's still pretty young. But if you can't wait, you're still in for a brawny red treat. A portion of the proceeds benefits the San Francisco SPCA. Very good QPR. 2005 Vinum Cellars Viognier VIO ($25). Made from fruit from San Benito County on the Central Coast, this excellent viognier has pronounced floral aromas or honeysuckle and jasmine and the taste of honeydew melons. It is perfumed and juicy, the perfect summer sipper. Very good QPR. 2006 Vinum Cellars Cabernet Sauvignon It's Okay! ($11). A rich rose, made of 100% cab grapes from Napa. Yes, a rose made with expensive cabernet grapes. It is dry, made in the Tavel style of France, with beautiful raspberry aromas and flavors, touched with a strawberry note. This is not your parents blush wine. Try it with bbq chicken, or some seared tuna. Very good QPR. 2004 Vinum Cellars Red Dirt Red ($30). This Rhone-style blend was made from grapes sourced in the Sierra Foothills of El Dorado County. In Chris and Richard's hands the classic combination of syrah, grenache and mourvedre yields a wine where rich red fruits combine with floral aromas of roses and violets to produce something really interesting and complex. Good QPR. 2004 Vinum Cellars Cabernet Franc "The Scrapper." ($30) A scrappy wine made with El Dorado fruit and an unapologetic attitude. Red currant aromas and flavors are held in check with a solid grip of tannins and a green freshness that would make this perfect for London broil marinated with balsamic vinegar and lots of rosemary. I think this will also settle down a bit and lose some of its tannins over the summer, so if you have a few bottles you might want to set some aside for beef stew in the fall. Good QPR. So if you find yourself in a wine store with no familiar bottles in sight and you spot one of the Vinum labels, pick it up without hesitation and know that you're in for a treat. But why wait until you're desperate? Try a Vinum bottling soon by clicking on one of the highlighted wines above. You'll be taken in some cases to Vinum's online store, and in some cases to a list of merchants in the US who stock their wines. Even if you aren't a member of the ABC club, there's a Vinum wine for you. I don't drink much semillon, in part because there isn't much of it sitting on the shelves and in part because I'm such a fan of really citrusy whites. 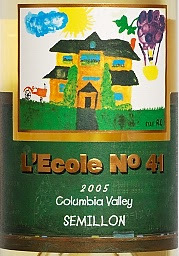 In my ongoing efforts to try wine that's new and relatively unfamiliar, I decided to pick up a 2005 L'Ecole no. 41 Semillon (between $10 and $20 through most merchants) from the Columbia Valley AVA in Washington State and see what I could learn about the varietal. Semillon goes into the blend of one of my favorite dessert wines, Sauternes, but it also is used in dry table wines like this one. 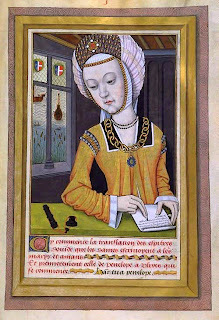 L'Ecole No. 41 is one of the most highly-recognized producers of this varietal in the US, so I knew I was in very good hands. The 2005 L'Ecole no. 41 Semillon had the same gleaming golden color that I associate with Sauternes. The aromas and palate were entirely different, however. When it was poured, I could detect scents of toasted bread, pear, and butterscotch. The butterscotch and pear continued in the flavors, accented by a very rich and round vanilla that made this wine feel velvety when you sipped it. Given its price tag and its abundant varietal characteristics, I felt this wine had excellent QPR. Semillon would go with a variety of foods, from roast chicken to chicken salad, omelettes, dishes with creamy sauces, and cheese dishes. Because of its rich mouthfeel, steer yourself towards food that has a buttery component. Semillon goes particularly well with scallops, for example, which (though seafood) have a buttery taste that sometimes clashes with citrusy, highly acidic wines. Try semillon with this recipe for scallops with orzo, tomatoes, and ginger. If you're intrigued by semillon, check out this month's Great Grape Day posts over on Sediments, the viticultural part of the WellFed Network where Andrew Barrow of Spittoon leads his merry band of contributors through the good, the bad, and the ugly of one grape varietal each and every month. April was semillon month, and there's a bunch of information over there ready for reading, just click on the logo to the right. I'm having a great time with Catavino's Virtual Wine Tasting for April, which is focusing on rose wines. The folks at Catavino know how to time an event--the May 31 Wine Spectator will have rose on the cover and a big story with their tasting notes. But thanks to the blogosphere you get a jump on the competition in the wine store! For my last rose post for Catavino, which gave tasting notes for a 2005 Bonny Doon Vin Gris, I experimented with a new format, first tried here at Good Wine under $20, called the "tag-cloud review." Here's my latest experiment in reviewing, which attempts to take the standard color/aroma/palate wine review and put it in the context of a much more common social interaction: meeting up with someone new. After all, having a glass of wine should be the start of a beautiful relationship between you, your five senses, and the wine in question. Most reviews just try to give you the high points you can expect as you get to know an unfamiliar bottling. But maybe this will put it in more friendly terms! I got great feedback on the "Tag-Cloud Review", so let me know what you think of the "Getting to Know You Review." First Impressions: I've never seen a rose this dark before. It's the color of slightly diluted cranberry juice, which makes me think this is going to be a rich, round wine. It's packaged in a relatively plain bottle, which has an attractive shape. And the wine comes from a region in the Languedoc-Roussillon area of France, an area known for its superb roses, so I'm pretty confident that this meeting won't be disappointing. Though I find it odd that this wine from the area where the Languedoc meets the Rhone has Rhone all over it and Languedoc no where on the label. Is this a case of Rhone wines being more familiar than Languedoc wines? Shaking Hands: I pop the cork on the bottle, and give the bottle a good sniff (never can wait until it's in the glass). Already there is a garden of flower smells emerging, especially roses (or do I just think I smell roses because of the rosy color? Is this the power of first impressions?) and sweet berries. The wine, once poured into a glass, is still that rich cranberry color, and still has all the smells of a warm summer garden. I already think I like this wine. Getting to Know You: Now it's time to really get to know this wine. I take my first few sips, and my first impressions were not wrong: I like this wine. It has round, strawberry flavors that tinge towards more powerful cranberry notes (or am I being influenced by my first impressions, I wonder?) It is not as dry as the Bonny Doon wine I had earlier, but it is not sweet either. It is ROUND and ripe, like a field-ripened, fresh-picked strawberry, and it even has a fresh strawberry's tannins around the edges, puckering up the borders of your tongue and making you thirsty for more wine. I wonder what's in it in terms of varietals, and the web reveals that it has 60% Grenache, 30% Syrah, and 10% Cinsault grapes. This explains a lot, since grenache is known for its berry and floral flavors and aromas, as is syrah. The Cinsault is best known as a blending grape with a sweet, sunny personality and low tannins. It's a nice blend here, and I particularly like the predominance of Grenache which I can really taste. And it goes well with my dinner companion, a rosy chicken tikka masala with warm spices, grilled marinated meat, and a creamy-tomato sauce. Waving Good-bye: I feel like I've found another friend on the wine shelves, one that is juicy and round without being sweet, that will go with nearly every food imaginable, and one that is priced right. Is there another wine type around that delivers so much in the neighborhood of $10? I don't think so; this wine is food-friendly, has abundant varietal characteristics, and excellent QPR. 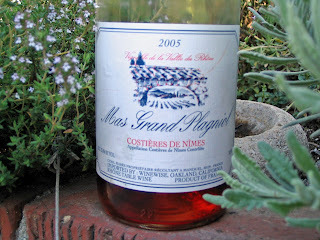 Will I buy a Languedoc-Roussillon rose again? Absolutely! (and I sure hope folks drink some for WBW #33). Am I sorry to leave you, yes. But is that a Spanish rose I see around the corner?? This rose makes me want to get to know more pink wines, and to deepen my knowledge of European rose bottlings. You still have time to participate in this April tasting, and you don't need a blog. If you've had a rose this month and remember what you thought about it, drop a note in the Catavino Forum. Two Good Wine Under $20 readers and fellow bloggers have already posted over there, Nate from VinVenio and Deb from Key West Wine Deb. The forum participants have left some good recommendations for you to check out when you need a rose in the upcoming months, and I'm putting some of my rose finds from Rhone Rangers in a separate forum post. I'll pop the cork on my Spanish rose, the grand finale of my April rose experiences, this weekend and post the notes in the forum and on the site on April 30. I'm back from the LA Rhone Rangers tasting, an annual event held to celebrate US plantings of Rhone varietals and to promote the knowledge of these grapes among US consumers. I tasted a lot of wine, nearly all of it very, very good. There were 40 producers at the event, which made it possible to really talk to the producers and learn about the wines. I was able to meet up with Four Vines and taste 2005s that were just put in the bottle, and taste some wine from Bonny Doon that didn't even have labels on it yet! 1. Paso Robles. If you don't know this appellation, and aren't yet seeking out wine from this area, do so ASAP. Tablas Creek, Anglim, Four Vines--they're all there, along with lots of other great wineries. And, they're producing simply superb, well-priced, high quality wines. I don't know what's going on over there, but whatever it is I heartily approve. 2. Sustainable, Organic, Biodynamic. I heard these words all over, from Zaca Mesa to Bonterra, to Bonny Doon. And if the wines I tasted are any indication of what can be produced from fruit that's not subjected to lots of chemicals, all I can say is bottoms up! 3. Rhone Grapes: Not Just for Blends. With the exception of syrah, most of us think of Rhone varietals in percentage terms--how much of X is in my favorite blend? But there are some stunning single-varietal bottlings out there, and I tasted some particularly good grenache, mourvedre, and roussanne. After having a thing for syrah for years, I am developing serious crushes on both mourvedre and grenache now! 4. The Three CCCs: Counoise, Cinsault, and Carignane. Expect to see more of them in stores near you. I'm still coming to terms with counoise, but all three grapes seem to add depth and structure (one maker described it as "backbone") to red blends. 5. Viva la Rose! : Rose is on everyone's minds these days--Catavino's, the Wine Spectator, the Rhone Rangers. Forget what you think you know about US roses and start tasting some of the great dry roses being produced from carignane, mourvedre, and grenache. And buy your bottles now, because after the May 31 Wine Spectator comes out, there won't be a bottle left on the shelf anywhere in the continental US. I'll have some detailed notes up soon, and there are some Rhone Ranger profiles to look forward to in upcoming weeks. Until then, see if you can find a retail store that stocks a good selection of Rhone Ranger wines. They're perfect for summer sipping and bbqs, and they go well with food. Red wines can be demanding drinking partners, with their high alcohol levels, robust flavor profiles, and dizzying array of rich fruit flavors, not to mention the veritable spice cabinet that can emerge due to oak fermentation and bottle aging. It's one of the reasons that red wines are so popular. But sometimes you want a red that is a little more easy to drink. In the wine biz, these wines are often called "approachable" because they exhibit rich fruit flavors that are comforting and draw you into the bottle. 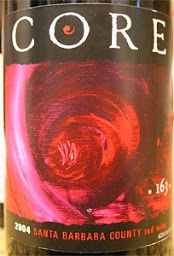 I had one of these approachable red blends from a superb Santa Barbara producer named Core Wine. Core is the brainchild of Dave and Becky Corey, who believe that "the core of every wine begins in the vineyard." The 2004 Core 163 ($12.99/375ml, Mission Wines; 750ml under $25 at many other merchants) is an outstanding, non-demanding red blend. It has a grenache base, which makes for lovely aromas of flowers and red berries. Sipping the wine reveals more of these flavors, and as the wine opens up in the glass there are notes of rich, milky chocolate with hints of herbs and cinnamon. Just 620 cases of this wine were made. The 2004 Core 163 blend is just plain yummy, and represents very good QPR with its abundant grenache varietal profile complemented with the aromas and flavors of syrah and mourvedre. Serve it with something simple and flavorful, like this great Korean barbeque pork accompanied by steamed rice or noodles (the leftovers make great sandwiches the next day). This is the fourth in a series of posts highlighting California family wineries. You might not be familiar with them--yet--but they produce wines that speak with the voices of this state's people, places, and history. They are worth seeking out. These posts will be longer than most posts on the blog, but I hope you will find them perfect for leisurely weekend reading and internet browsing. Have fun! To read previous posts in the series, click here. Gentlemen may prefer blondes (though I've never been absolutely convinced about that). I know this because I've tasted some of the wines from the Red Head Ranch portfolio, and they are astonishing. It's rare to taste wine and still be able, weeks afterwards, to remember what struck you so forcefully about one producer's wines. 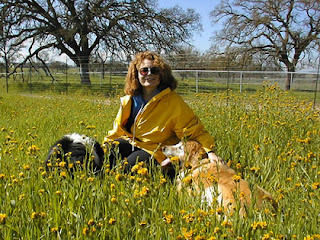 But I can remember exactly what blew me away about Red Head Ranch wines at the Family Winemakers Tasting in March: they have elegance, silky texture, powerful flavors, and balance. Think Rita Hayworth. Can you see her in your mind? OK, Red Head Ranch makes Rita Hayworth wines. When I met Marilyn, she was standing proudly behind her lineup of wines, with her son at her side. She had a quiet dignity that I think is linked to the enormous respect that she has for the wine she makes, and the people who make it with her. At the tasting, she was the first to give credit to her consulting winemaker, Steve Glossner, for his skill. And on the website, the members of the Red Head Ranch family are highlighted, and their individual contributions noted, from her husband Peter (the CEO or "Chief Equipment Officer), to business partner Leon Chen, manager Darrel Heirendt, supervisor Rodrigo Lamas, and vineyard workers Leopoldo H. Mendez and Leopoldo Mendez, Jr. This is truly a modern family winery--in the very best sense. Peter and Marilyn bought the Red Head Ranch in Paso Robles 1997, becoming custodians of historic vineyard properties that date back to the 1880s. One of Marilyn's passions is the care and feeding of "Grandma," one of the vines that remains from those first plantings which she tended and brought back to flourishing life. Since then, the Ashkins have been able to purchase the Beckwith Vineyard in 2001, and to partner with Leon Chen at the Old Bailey Vineyard. On to the wines. The 2004s I tasted, and which are reviewed below, are Red Head Ranch's third bottlings. Currently, Red Head ranch is selling these wines in multiples of 3 bottles through their online store. Clicking on any of the wine names below will take you to the appropriate page in their store, where you can learn more. Red Head Ranch also has a wine club, which would enable you to get a half-case sampler every six months at a reduced, members-only price. Of course, if you want to try their wines you can also heckle your local store to carry them--I'm lobbying my local shops, I assure you! 2004 Red Head Ranch Cabernet Sauvignon ($29). I loved this wine--and at the price it represented excellent QPR. 75% Cabernet Sauvignon grapes are blended with 25% Petit Verdot to produce a rich, full-bodied wine. Abundant aromas and flavors of cassis and coffee are accompanied by a distinctive note of pencil shavings that is more common to fine Bordeaux than New World wines. Unfiltered, this is an outstanding old-world style cabernet blend. 2004 Red Head Ranch R3 ($24). An intriguing blend of three varietals: Syrah, Cabernet Sauvignon, and Malbec. The amazing thing is, you can taste all three! This is a blend with brains--not a single blurred or mushy note mars it. Red fruit aromas turn into a cascade of plum, cassis, and smoke. Excellent QPR for this easy drinking red, which is again marked by a lovely silkiness of texture. 2004 Red Head Ranch Pinot Noir ($28). No, I did not type Pinot Noir by mistake. Paso Robles Pinot? A relative rarity, but Red Head Ranch proves it can be done! Pinot Noir is a showcase varietal for Red Head Ranch's ability to make silky, elegant, and balanced wine. Here the flavor profile is dominated by cherries, with notes of mushroom, earth, roast coffee and cocoa to keep the wine interesting. Excellent QPR on this complex pinot charmer. 2004 Red Head Ranch Cabernet Sauvignon Old Bailey Vineyard ($40). This outstanding young cabernet is made entirely of Paso Robles fruit from the Old Bailey Vineyard, where the varietal is Leon Chen's passion. That passion shows in this wine, with its bright red fruit aromas and flavors accented by cocoa and dark chocolate notes. This is still a young wine, and needs some time to settle down and show to its full potential. I suspect this will grow into a signature wine for the Ranch, one that has great balance with that distinctive RHR silkiness and finesse. Only 150 cases were made of this very good QPR cab, that would certainly qualify as a special occasion wine. Red Head Ranch also bottles Zinfandel (both Late Harvest and regular), Chenin Blanc, and Petit Verdot. I didn't taste these wines, but if you have please leave a note and let us know. Meanwhile, remember that gentlemen may prefer blondes, and perhaps even marry brunettes, but if you want to be where the grapevines are, stick to Red Heads. Here are my first tasting notes for the Catavino Virtual Rose Tasting. First a big thanks to Gabriella, Adrienne, and Ryan for a great event, which I'll be continuing to contribute to over the next 11 days as I open two more bottles of Rose. In case you don't remember what this event is all about, just click on the link above to find out more. Next up: a French rose, followed by a Spanish rose (my first) and a summary of what I've discovered about these wines after popping the corks on three bottles. Additional thanks to Ryan, who inspired me to think of a way to review a wine that isn't the standard color/aroma/palate. I decided to pioneer the "tag-cloud wine review," accompanied by an evocative picture that I think conveys the feeling of this wine. Let me know what you think--and if you can figure it out! I'm not sure this works, but it will be interesting to get your feedback. And if you hate it don't worry: it was pretty hard to do so the rest of my reviews will be as they have been! LA TASTING ALERT: This just in. If you are in LA and want to try some interesting roses, Colorado Wine Company in Eagle Rock is having a rose tasting on Saturday, April 21st from 4-6 pm. The cost is $15/person, which includes 5 wines and gourmet cheeses from Auntie Em's Markeplace. Wines to be poured include roses from Spain, Argentina, Oregon, and California--so you will be perfectly situated to contribute to the virtual tasting forum! 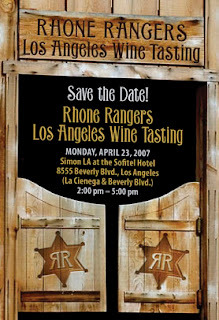 Colorado Wine asks you to kindly RSVP to info@cowineco.com or (323) 478-1985 if you plan on attending. After sadly missing out on last month's Wine Blogging Wednesday due to logistical and timing difficulties, I will be happy to get back on track in May with WBW #33, hosted by Marcus of Doktor Weingolb. The topic is spot-on for GWU$20 readers, namely to investigate the claim that wines from Languedoc-Roussillon that are priced between $15 and $30 represent exceptional value. Check out the full brief by clicking here, and if you are at all confused when reading French labels also stop by Marcus's helpful list of Languedoc-Roussillon appellations and producers. Entries are due in on Wednesday, May 16. So you have a full month to find a wine and drink along with the rest of us in this virtual tasting event. You don't need a blog to participate, as Marcus will be taking tasting notes in the comments section of his blog on the day. As usual, I don't have a wine that exactly fits the criteria--at least not one I've not blogged about. My only contender in the cellar is the 2003 Coupe Roses Minervois and I already gave a rave review to that a few months ago. If that wine was any indication of what to expect, we're in for a great time. So I'm off to the wine store to look for some (more) good vino. First, let me say there is nothing "petit" about this wine. It is lush, rich, and satisfying. Don't let the name fool you. Petit Verdot is a robust varietal traditionally used in Bordeaux blends, where its tendency to ripen late (if at all) led vintners to rely less and less on the grape. But in California--well, that's a different story, as Escafeld has proven. 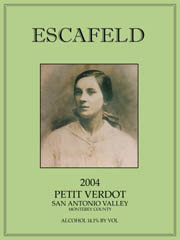 The 2004 Escafeld Petit Verdot has excellent QPR, with complex yet food-friendly aromas, flavors, and textures. Aromas of coffee and chocolate leap out of the bottle from the moment you pull the cork, and once the wine is in the glass rich berry aromas are added. Flavors of blackberries and huckleberries dominate the flavors, embedded in a silky texture. That rich coffee/chocolate mix wends its way all through the finish, held up by a nice acidity that keeps this wine from becoming a fruit bomb. I suspect that this wine will continue to improve and develop for the next 2-3 years at the very least--but who can wait to drink it that long? I know I can't, and there's no reason to wait when it's so very tasty now. We had it with some yummy burgers and a salad, but it would be just at home with ribs, any kind of barbeque, stews, or roasts of any description. Escafeld Vineyards is located in the new San Antonio Valley AVA. Steve and Elsbeth Wetherill make the wine, and Elsbeth writes a wonderful blog that will tell you all about life in the vineyards, and how your wine was made. They're a relatively new operation, but they're receiving all kinds of accolades, including a Double Gold-Best of Class for this very wine from the 2007 San Francisco Chronicle Wine Competition. And if you are wondering who the lady is on the label, its Elsbeth's grandmother, Mary-Ann Jones. She was a publican's wife in Liverpool, at about the same time that my Mom was a child in the very same city. I like to imagine that my grandmother and grandfather stopped by Elsbeth's grand-dad's pub in the Whitechapel neighborhood, and that my uncle went there for his after-work pint when he'd finished walking his beat as one of Liverpool's finest. Tonight I'm raising my glass of Escafeld Petit Verdot in memory of all our collective Liverpudlian connections. But you don't need a connection to the Mersey to indulge yourself--get some of this wine now. It's a winner. Why do you blog? Russ at Winehiker started a game of blog-tag posing this question, and he tagged Farley, and Farley from Wine Outlook tagged me and now, I'm It. 1. Why start blogging? Part of my day job requires that I write--a lot. Often these writing projects take years--hell, sometimes they take decades. There is a lot of delayed gratification and long-term thinking involved in most of the writing I do. I started blogging because I thought that committing myself to write something every day, and instantly seeing the results, would have positive effects on the other writing that I do. And, I was right! Now that I write nearly every day on the blog, I find its easy to roll from the blog to my other writing. I also find that my other writing tends to be less forced and more fluid when I sit down to the other stuff. 2. Why do I blog about this? I went to school and then taught at UC Davis, i.e. Wine Education Mecca. I learned a lot about wine from the courses and contact with great professors there. (even though, I hasten to add, I was not a Vit-Eno major) This blog represented a way for me to focus my wine drinking and evaluation on two of the most valuable things I learned through those experiences: the importance of judging a wine by varietal characteristics, and the huge benefits associated with owning your own copy of Ann Noble's Aroma Wheel. 3. Why keep blogging? I never imagined anyone other than my parents and friends would read this blog, so it has come as a pleasant surprise to become part of a community of bloggers, wine geeks, and those just starting out on their wine journeys. I keep blogging not only because of #1 and #2, but because now that this blog is up and running it continues to engage both me--and a widening audience--of readers and contributors. 5. Why do I think blogging about wine matters? Because everyone who writes, reads, or contributes to a wine blog is participating in an information revolution. I truly believe that blogs are changing the way people learn about and consume wine. 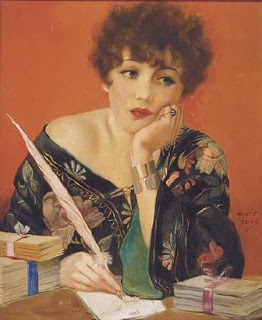 In particular, I am committed to getting more women to actively engage with wine writing, because women purchase 77% of wine in the US and yet represent only a small (growing to be sure, but still small) fraction of wine writers both in the blogosphere and outside it. So I encourage everyone--women and men--to read, write, and leave comments as you travel through the blogosphere to keep the information rolling. New voices are crucial in wine writing, and those new voices include YOU. So, now I get to tag people! This was truly hard because my possible options included all the people whose work I respect and admire, folks who inspire me, my blogging friends, and then folks like Jancis Robinson (I don't have the cajones to tag her, I confess, but if you're reading, Ms. Robinson, please feel free to respond). But to continue with my riff in #5, I decided to "remember the ladies" and tag some of my favorite women bloggers (minus Farley at Wine Outlook and Sonadora at Wannabe Wino, because they've already been tagged). Click on over to the sites below through the following links so they know they've been tagged--I know that they are probably too busy to read my site everyday and know that they're IT! So here's what I want to know from the ladies below: why do YOU blog? Sauternes. If there is a heaven, and I get there, this is what I'm drinking. Every day and every night. It's magical stuff, an alchemical mix of Semillon and Sauvignon Blanc and a special rot called botrytis. Who knew fungus could taste so good. There are shockingly expensive Sauternes (Chateau d'Yquem, anyone? ), but there are also suprisingly affordable wines with rich concentration and a dazzling array flavors. So even if you're in the under $20 end of the wine budget spectrum, you can pick up excellent half-bottles of sauternes, which for a dessert wine represents quite a bargain. The 2003 Ch. Sigalas Rabaud ($16.99/375 ml, K&L Wines), for instance, represents excellent QPR. It's an outstanding young Sauternes that really won't even hit its stride until 2008. Even as a relative juvenile, it already has abundant aromas and flavors of apricot, honey, and a wonderful toasted coconut note. Added to this, the wine is exhibiting a lovely, silky texture. The sweetness and acidity are in nice balance in this dessert wine, so you don't have to worry that this is somehow too sweet. It will be interesting to see how this wine is drinking in a few years when I open the next bottle. Hard to imagine it could get better, but the experts say it probably will. What to have it with? Nothing. Just sit down, pour yourself and someone you love a glass, and put your feet up. Voila. You're in heaven. They've been making wine at Chateau Sigalas Rabaud since at least 1660, and the Wine Doctor has a super profile of the chateau and its production, if you'd like to learn more. If you've never had any Sauternes, seek some out and give them a try. And if you love it already, please let us know which are your favorites and what you pair them with, if anything. There's still time to join in the fun of Catavino's Virtual Wine Tasting event for April: Iberian Rose vs. ? Rose. Between now and April 30, see if you can find a Spanish or Portuguese rose. Wine critics and drinkers alike agree that the Iberian peninsula is producing some of the very best dry roses in the world, and Gabriella and Ryan of Catavino would like us to see what we think. After whining that Spanish rose would be hard to find in LA, I found a surprising range of Spanish roses for under $10 at BevMo. And lots of French roses for about the same price. So, too, Mendocino and other California rose. If you want to drink along with me, here's what I'm going to be tasting and reporting on between now and April 30: the 2005 Cortijo III Rioja Rose Garnacha ($9.99); the 2005 Bonny Doon Vin Gris de Cigare ($10.99); the 2005 Grand Plagniol Rose ($9.99). If you live in California, all these should be easy to find at your local Beverages & More. So pick up one of these bottles and drink along with me, comparing notes and seeing how different roses from different reasons stack up. For Gabriella's brief, click over to Catavino for the details. And best of all, you certainly don't need a blog to participate, since they've set up a forum for our tasting posts. I will post my notes over there, but put a post here, too, with a link to the full range of responses. It's spring. Time to think pink, and fire up the BBQ! This is the third in a series of posts highlighting California family wineries. You might not be familiar with them--yet--but they produce wines that speak with the voices of this state's people, places, and history. They are worth seeking out. These posts will be longer than most posts on the blog, but I hope you will find them perfect for leisurely weekend reading and internet browsing. Have fun! To read previous posts in the series, click here. In Renaissance Venice, two things were prized above all else: family and land. (Allegory of Venice by Carpaccio) Venice didn't have much land to speak of, and what little there was seemed constantly at risk of being washed into the Adriatic, but the city's rulers knew that land was important. Most Venetians have a deep yearning to own something --anything -- permanent and lasting to hand down to their descendents. The ghosts of the city must smile every time they think of Brutocao Cellars, where a Venetian family married into a family of Mendocino County farmers and put down deep roots into the California soil. It was Venice's two obsessions--with family, with land--that kept Venice strong, century after century. And its what makes Brutocao Cellars wines so special today. Len and Marty Brutocao lead a family effort to make wine that is a homage to their Italian heritage and a testament to the hard work started by Marty's father, Irv Bliss, when he bought land in Mendocino County back in the 1940s. (picture of Len and Marty Brutocao courtesy of Brutocao Cellars) Folks were just starting to think about planting and cultivating wine grapes again after Prohibition, but not many were thinking of the remote reaches of the Northern California coast. 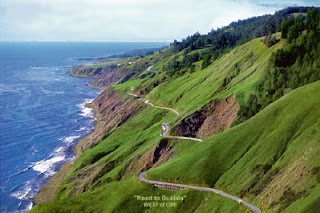 But Irv Bliss thought this land could yield some fine wine, and he was proven right. Beginning in 1991 with the help of family and friends, and later with the help of Fresno-native and UC Davis graduate winemaker Fred Nickel, the Brutocaos began putting out some lovely examples of California wines made with Italian and Bordeaux varietals. 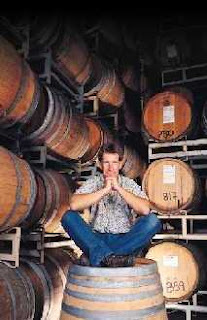 (picture of Fred among the barrels courtesy of Brutocao Cellars) Farming over 475 acres of choice land and planting more than 12 grape varietals, the Brutocaos paid attention to the best traditions of winemaking. To honor these traditions, they chose the Lion of St. Mark--the symbol of Venice--to mark their wine bottles and name their wine club. Brutocao Cellars is also interested in starting new traditions, and they are part of a group of Mendocino Winemakers who collaborate on the Coro Mendocino project. Operating under strict production rules like a European DOC, eleven Mendocino wineries (Brutocao Cellars, Dunnewood Vineyards, Eaglepoint Ranch, Fetzer Vineyards, Golden Vineyards, Graziano Family Wines, McDowell Valley Vineyards, McNab Ridge Winery, Oracle Oaks Winery, Pacific Star Winery and Parducci Wine Estate) make a special, ultra-premium wine with Zinfandel at the core and other varietals added in unique proportions that reflect the special characteristics of each particular vineyard. "Coro" means "chorus" in Italian and Spanish, and the name Coro Mendocino reflects winemakers' efforts to harmonize all the individual, strong voices coming out of the county's vineyards these days. When Jeff Miller took the time to share Brutocao's line of wines with me at the Family Winemakers Event, it was clear to me that they are distinguished not only by the care with which they are made, and the traditions that the family draws upon, and the alliances that the Cellars has with other area producers. What distinguishes Brutocao's New World wines is that they have Old World soul. They are food wines--meant to be opened around a dinner table full of friends and family, with plates of food, good conversation, and lots of laughter. These bottlings contain the stuff that everyday wine culture in American should be based on, with their juicy fruit, complex flavors, and soft elegance. Here are my brief tasting notes for my favorite Brutocao Cellars wines, with links back to the Brutocao website (soon to be launched in a jazzy new version, but the links will still work) so that you can order some wine for your own collection. My local wine store here on the Sonoma Coast stocks their wines, so ask your retailer if they can get some to have on hand when the yearning for some good wine hits you hard. It's also worth knowing that they have a second, value-oriented label, Bliss Vineyards, so keep your eyes peeled for that line of wines, too. 2004 Brutocao Quadriga Hopland ($24) A yummy Cal-Italian blend of sangiovese, primitivo, dolcetto, and barbera. Lovely red and black fruit aromas, are accompanied by warm, spicy notes and real structure as the flavors unfold and develop. This would be age-worthy, but you may not be able to wait its so good now. Possibly my favorite from the tasting, and there was a lot of competition! Excellent QPR. 2004 Brutocao Estate Bottled Cabernet Sauvignon ($20; also available in large-format 3L bottle for $100) Made from fruit harvested from the Hopland Ranch's Contento and Feliz vineyards, this outstanding cabernet has rich cassis aromas and flavors with a distinctive whiff of pencil lead shavings that made me think of Bordeaux. This wine is still young, and has a strong grip of tannins, so I'd age it a year or two to give it time for its flavors to shine. I'd save it for the holidays in 2008! Excellent QPR. 2003 Brutocao Merlot Estate Bottled Bliss Vineyard ($20) What a nice merlot. Juicy cherry and blackberry aromas and flavors are woven with spicy cedar notes that extend through the finish. Enough to make Miles turn away from his Pinot Noir, and a marvelous wine to pair with food, whether summer BBQ or autumn stews. Excellent QPR. 2005 Brutocao Chardonnay Bliss Vineyard ($16) The versatility of the Brutocao portfolio is exemplified in this chardonnay, where a touch of oak brings out the apple and pear aromas and flavors characteristic of the varietal. Soft vanilla notes accent this appealing chardonnay. Very good QPR. 2006 Brutocao Sauvignon Blanc Estate Bottled Feliz Vineyard ($14) Yet another find from Brutocao, this time a nicely-balanced, citrusy sauvignon blanc. Aged in stainless steel to preserve the freshness of its aromas and flavors, grapefruit and other citrus flavors dominate a flavor palate that starts out soft with melons and grasses. Very good QPR. The extended Brutocao vineyard family not only produces great wine, they lead by example in showing us what a great thing it is when European culture (especially wine culture) meets up with American can-do spirit. They have opened cafes and bistros alongside their tasting rooms in Philo and Hopland, because they believe that wine and food are partners. 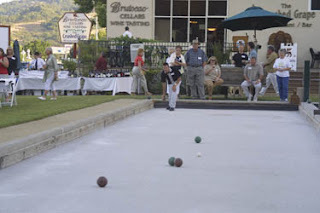 They host bocce tournaments because they know that families and friends who play together, stay together. (photo courtesy of Brutocao Cellars) They hold chili cook-offs for the Tri-County Little League because they believe in the future of the area. And they know deep in their bones that wine, if made with this kind of passion and commitment, is as permanent and lasting as any Venetian could wish. What Style of Wine Consumer Are You? Overjoyed to be on vacation and have access to high-speed internet for the first time in a week, I caught up on my blog reading and browsed through Wednesday's New York Times--always a high point for me, since it has Eric Asimov's wine column. I admire and respect what Asimov has to say about wine, and what he is doing to broaden the knowledge of wine in the US. This week, Mr. Asimov had two different wine shops put together mixed cases of 12 wines, with a budgetary limit of $250, that are to be drunk with food. The purpose? To learn more about wine. You can read the lists over at his blog The Pour if you don't have a subscription to the NYT, where (if you do have a subscription) you can read the whole story "To Study Wine, Buy and Drink." At The Pour you can also read the 40+ comments that this buying strategy has engendered. By the time you read this, it may be 50+. In the comments section, fans applaud the mixed case as a brilliant, innovative strategy for learning about wine. Critics deplore the preponderance of French wine, and wonder why there aren't more US labels in the boxes that Chambers and Sherry-Lehmann put together for Mr. Asimov. Some urge new wine enthusiasts to set the budgetary bar lower, say at $150 per case, to avoid bitterness and recrimination when they discover they don't like Grenache. And through what magical rites do you find these wines, wonder some, without having a trusted retailer fill a box for you and without falling back on the dreaded 100-point Ratings? I, on the other hand, wonder what the fuss is all about, since this is exactly how I buy and drink wine on a monthly basis. 12 interesting, unusual bottles for $250 total. Hey, it's good wine for --mostly--under $20! Where have I seen a blog like that? And as for how to find these treasures, do the readers of Asimov's column read any wine blogs at all--except maybe The Pour? If you want a magical rite, here it is: Go to my side bar. Say "hocus pocus." Click on one or more of the links under Wine Blogs Worth Visiting. Presto. Wine recommendations you can count on! I started thinking that maybe buying a the mixed case is really an uncommon way to buy wine in the US. Perhaps I was warped from years of living in the UK, where the mixed case is something every merchant not only offers, but also advertises. (like in the advert from the UK's Majestic Wine Warehouse at the top of the post). They even put together mixed cases on themes like "Southern French Finds" and "Unheralded Whites" and so forth. You pop in to a store or order on line and presto, 12 new wines for you to try. How do you think everyday wine culture takes root and flourishes, folks? From what I see in Europe, it's seldom the result of peddling expensive chardonnay and cult cabernets in season and out. Variety is the spice of life! Drink widely. Try carignane! Then again, maybe my love of the mixed case says something about me as a wine consumer. True confession time: I have a low, low boredom threshold. Picture someone you know with the lowest boredom threshold imaginable and then lower their boredom threshold by the power of 10. That's me. I would no sooner drink bottle after bottle of pinot noir (much as I love it) as I would bottle after bottle of wine made by one producer. But there are folks out there who are just the opposite. There are folks who buy wines by the case from a single maker, collect verticals of their favorite wines, and seek to become expert in specific regions, varietals, or producers. If I am a member of the Low Boredom Brigade, then they are definitely marching to the beat of the Pursuit of Expertise Squad. And more power to them. That's why the blogosphere is such an unbelievable resource for all of us. What kind of wine consumer are you? Low Boredom Brigade? Pursuit of Expertise Squad member in training? A bit of both? Leave a comment and 'fess up about how you buy, drink, and enjoy your vino. Yes, you can even confess that you don't drink wine with food if you want. Your secret is safe with us. Do you love Chianti? I do, too. It was one of the first wines that caught my imagination, that made me think, oh, this is wine. Chianti is made with sangiovese, and this varietal makes up the heart of those smoky-sweet cinnamon and plum beauties. What's more, Chianti runs the gamut from simple, food-friendly table wines bound up in rush fiascos with a bit of rusticity to complex, expensive reserve bottlings. But the popularity and name-brand appeal of Chianti has been driving prices steadily upward recently. And if you like Chianti, you will probably like other wines made predominantly or exclusively from sangiovese grapes, such as Vino Nobile de Montipulciano and todays pick, Morellino di Scanscano. Far, far to the south of Chianti--but still in Tuscany--lies Scansano, a town in view of the Tyrrhenian Sea. They cultivate morellino there, a strain of sangiovese grape that goes into wine that has many of the earthy and sweet characteristics of a good Chianti at a fraction of the price. 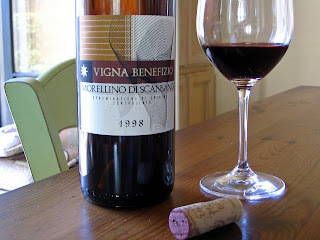 The 1998 Cantina Cooperativa Del Morellino di Scansano "Vigna Benefizio" ($14.99, Colorado Wine Company; ) was an outstanding example of an older sangiovese with excellent QPR. A robust deep ruby color blended towards brick-redness at the edges where the wine touched the glass--a classic indication of an older red wine. But the age of this wine did not diminish the aromas of black cherry, cassis, and herbal aromas, nor did it blunt its full flavor palate. Even more surprising, there was still lots of acidity in this wine, so much so that when it was first opened you got the merest hints of spritziness, which abated as soon as the wine was poured. As you drank this wine you felt that you could smell and taste the sun-drenched fields of the Maremma region, and that acidity brought to mind open vistas of ocean and salt spray. Morellino di Scansano wines, like Chianti, are excellent with grilled meats and tomato-based pasta sauces. Their earthiness, combined with just the right amount of acidity, stands up to this traditional Italian fare. We had it with a North Beach chicken and pasta dish that had spinach, mushrooms, a tomato ragu, and spoonfulls of ricotta cheese to stir in at the table. Unfortunately, the recipe isn't online but you can find it in Brian St. Pierre's excellent cookbook, The Wine Lover Cooks Italian. You probably won't be able to find this vintage of Morellino di Scansano, or this exact maker, but you will be able to find a bottle of Morellino in good wine shops if you look for it. Easy to find brands include Fattoria le Pupille and Cecchi, and Terry Hughes of Mondosapore reminds all of us to keep our eyes peeled for other importers, like Poggio Argentiera, too. These bottlings provide a good value way to begin exploring the world of Italian wines and native varietals, so remember: Sangiovese. It's more than just Chianti. Albarino has caught the American imagination. The US is now the #1 importer of wines made with this grape, as reported in an article recently in the SF Chronicle. The article also suggested that Albarino was the perfect wine for spring, and having just opened my first Spanish white, I cannot agree more. I was tipped off to this wine by Sonadora at Wannabe Wino, who gave me a list of good Spanish whites to try out when I posted my New Year's Resolutions. Heavily planted in Spain's Rias Biaxas region in northwestern Spain, it is also planted in Portugal where it is known as Alvarinho. American vineyard owners and winemakers (including Qupe and Babcock) are just beginning to explore the potential of domestic plantings of the varietal. 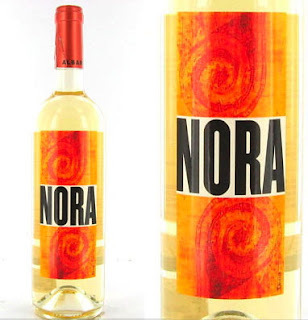 The 2005 Vina Nora Albarino ($13.99, Colorado Wine Company; available through many other merchants for under $15) is light gold in color. It has characteristic varietal aromas of sweet honeysuckle and orange blossom. Its flavor profile is predominantly citrusy, with bracing acidity and a dry finish. Somehow, this wine managed to be both round and fresh, which is indeed the perfect combination for spring, with meals that include ham, roast chickens, and salmon popping up on many tables. These foods can quickly wash out a wine that has no body, but Albarino was a good match. All considered, I thought this had very good QPR, and would definitely become one of my go-to wines in the store. I am trying to expand my regional cooking knowledge along with my Iberian wine knowledge, so we had this with a quick version of cataplana, a traditional Portuguese stew made with pork and clams. Here mild Italian sausage is substituted for the traditionally slow-cooked pork in the dish. You need lots of good bread to sop up the flavorful sauce, and once you toss together a green salad you are all set for a meal that makes you feel you are have a spring dinner al fresco, even if you are not. This is the second in a series of posts highlighting California family wineries. You might not be familiar with them--yet--but they produce wines that speak with the voices of this state's people, places, and history. They are worth seeking out. These posts will be longer than most posts on the blog, but I hope you will find them perfect for leisurely weekend reading and internet browsing. Have fun! To read the first post in the series, click here. I discovered one of these thoroughly modern families at the Family Winemakers of California tasting: the Four Vines Winery family of Paso Robles, Amador County, and Sonoma. The family started with Christian Tietje, a wandering chef who came to San Francisco from Boston in 1990, and fell in love with old vine Zin. 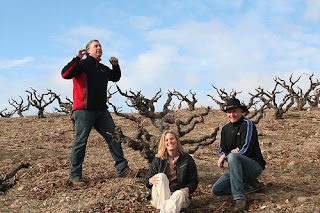 In 1994, the family grew from Christian and Zin to include Susan Mahler (aka Sam), a pilot and earth scientist, who quickly fell for Christian, his Zin, and the backbreaking and absorbing work of tending vineyards. They moved to Paso Robles, started Four Vines Winery, and focused on making appellation-specific Zins and--at a time when this was a complete heresy--unoaked chardonnay. As the business grew, they needed help, and help came in 2004 in the form of Christian's childhood friend Bill Grant, who managed the finances and marketing for the burgeoning enterprise. 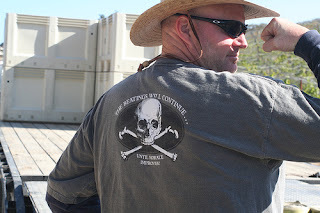 Today the family includes tasting room wine pushers, crush slaves, cellar masters, keepers of wine, growers, pirates, bikers, and self-appointed "ZinBitches." Not to mention a growing mob of satisfied consumers and fans. 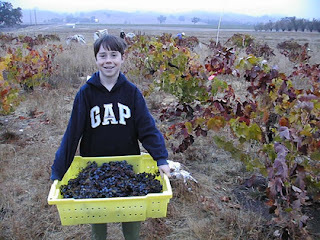 (photo of Bill, Sam, and Christian with their grape-children courtesy of Four Vines and FutureWorks). Together, the Four Vines family wanted to introduce some fun into wine, and to blow the cobwebs off what (especially in the 1990s!) was becoming an all too stultifying and stuffy wine culture. They gave their wines names like "the Biker," "Maverick," and "the Heretic." They started holding Zinfandel Festivals with pirate themes long before Johnny Depp had even thought of donning an eye patch. They were among the first to appreciate the sensory pleasures that came from making Zin from grapes that came from old vines. And they loved seeing how Amador fruit differed from fruit sourced in Paso Robles, or Napa, or Sonoma. 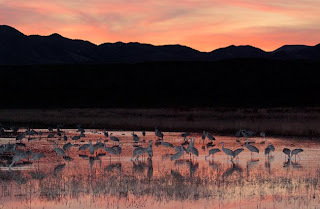 There is an old expression--"the genius of the place"--that was used in the 18th century to describe the spirit that inhabited a particular spot. Architects and landscape gardeners were supposed to try to capture the genius of the place in whatever work they did. The Four Vines family seems to have applied this concept to their winemaking, and the results are stunning. They produce rich, complex wines that have an intriguing silkiness on the palate. Every zin has a different cascade of flavors and aromas that evolve from your first sniff and sip. And the other wines that they make are truly memorable examples of the varietals that go into the bottle. What follows are my brief tasting impressions of their line of wines. You are going to be hearing a lot about them in the upcoming months, based on coverage the winery has already received this year from Wine & Spirits and Wine Spectator. Buy the wine now if you want it, because the 2004s are nearly sold out. Or, save yourself the aggravation and join their wine club, thereby insuring that you will get your required stash of new Four Vines wines as they are released. The first 2005 reds will be released in late May, so circle this date on your calendar and check their website so you aren't disappointed because, yes, they, too, are going to sell out. After that, piracy will be your only option. Prices below are those suggested by the vineyard. Click on the name of any wine to be directed to merchants in your area or online who might be offering the wine at higher or lower price points. 2005 Four Vines Chardonnay Naked Chardonnay ($14) This excellent unoaked chardonnay, made with Santa Barbara County grapes, has striking butterscotch and soft pear aromas that are followed up with fresh pear and citrus flavors. Juicy, easy to pair with food, and excellent QPR. 2004 Four Vines Zinfandel Old Vines. ($18) I doubt that you could fine a better Zinfandel at this price. It has a superb balance of fruit, spice, and acidity with warm aromas and flavors of blackberry, clove, and pepper. This wine will improve further with a little time in the bottle. Excellent QPR. 2004 Four Vines Zinfandel Biker ($20) This rough young zin from Pas Robles should settle down and shed some of its acidic tannins with a bit more time in the bottle. Its blackberry and pepper flavors and aromas are struggling a bit to come forward now, but all the structure and potential are there so give it some more time and it will be superb. 15% alc/vol. Excellent QPR. 2004 Four Vines Zinfandel Maverick ($20) Soft blackberry-toned fruit from Amador County, with 14. 9% alc/vol. I found a very good balance of fruit and spice, and lots of complexity as the two wove together. Excellent QPR. 2004 Four Vines Petite Sirah Heretic ($30) Absolutely stunning petite sirah. Cocoa and cassis aromas and flavors, with a smooth and silky cassis palate with notes of fresh picked blackberries. Seek this one out. It's fantastic. Very good QPR. 2004 Four Vines Syrah Bailey Vineyard($30) An impressive syrah with beautiful, jammy plum and cassis notes. Warm spices complement the fruits and add complexity. Very good QPR. 2004 Four Vines Anarchy($30) This nouveau Rhone-style blend made with Paso Robles fruit has an infusion of zin that you can really taste. Made with syrah, zin, and mourvedre. Jammy red and black fruits, nice spice. Good texture and mouthfeel. Good QPR. 2004 Four Vines Peasant($30) Another wine made with Paso Robles fruit, this intriguing red blend is dominated by syrah and mourvedre. Soft and smooth blackberry fruits, touched with vanilla and cracked pepper. Good QPR. These are wines that are full of the genius of the place, and the genius of the people who make them. You won't be disappointed with their wines, and you may find yourself behaving like a pirate and starting your own treasure chest of Four Vines wines. When I went to school in Massachusetts, Connecticut was not thought of as a great viticultural center. But that is changing now, with more and more regions of the US trying their hand at growing wine grapes. While grapes have been grown in the state for hundreds of years on small family farms, the first modern wineries were established in the late 70s. Currently, there are more than 15 vineyards in the state, all producing wine with limited distribution. Recently I had a wine from Sharpe Hill Vineyard in Pomfret in the eastern part of the state. Sharpe Hill's wines have have received over 185 medals in international wine competitions. The NV Sharpe Hill Vineyard "Ballet of Angels" white blend ($10.99, Colorado Wine Company), nick-named "Creepy Baby Wine" by irreverent consumers due to its distinctive label, is the best-selling Connecticut wine. And for me, it was a real eye-opener. This excellent QPR wine made from a secret blend of ten white grape varietals that probably includes melon de bourgogne, riesling, vidal blanc, and vignoles. Plentiful aromas of honeydew melon, honeysuckle, and citrus hint at the flavors that develop as you sip the wine. Though floral and slightly off-dry, a bracing acidity keeps the sweetness from becoming cloying or overpowering. This was a wonderful wine that would be exceptional with spicy food or Asian cuisine, like these Thai peanut noodles with chicken, or Thai salmon with rice salad. The store where I bought this, Colorado Wine Company in beautiful downtown Eagle Rock, specializes in unusual, high value bottlings like these. It's worth stopping by if you live in the LA area or are here on a visit. They recently started a blog for customer reviews and discussion of wine. It's a great idea for Wine 2.0 types, and I've already found a great blog I didn't know about while reading. The NV Sharpe Hill Vineyard "Ballet of Angels" is widely available throughout the country, but if its not to be found at a store near you, ask your local merchants if they can start carrying this great white wine. If you like Riesling, you will love the "Ballet of Angels." So How Bad IS Hwy. 1 in Sonoma County? Wish me luck as I transport 3 humans, 2 dogs, several cases of wine, and all kinds of other paraphernalia related to a two week vacation over the Tejon pass, up the valley, through the Bay Area, over the Richmond Bridge, across Pepper Road, through Valley Ford, past Tomales, and out to scenic Highway 1 for the last hour or so of the drive to our redwood hideaway. Timing depends on local road conditions including but not limited to: cow grazing patterns across Hwy. 1, number of Winnebagos on road, fog, folks who don't understand the meaning or use of "turn-out," how good the surf is and therefore how many surfers are parked between Jenner and Bodega, landslides, downed trees, and road construction. (hair-raising aerial photo taken by Scott Wilson of West of One). I'll be back Thursday after Good Wine Under $20 lands temporarily on the wild and woolly reaches of Sonoma County's north coast. Some wines announce themselves with with a gentle purr. This is not one of those wines. This is a bare-knuckle prize-fighter of a wine, a big, bruising red that is not for the faint of palate. It is a wine that needs some careful handling to bring out its softer, more sensitive side. But it is unusual, and (like many prize-fighters) possesses an unforgettable character. 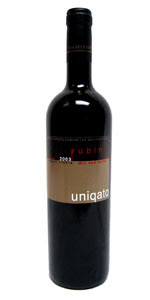 The 2005 Damianitza Rubin Uniqato ($7.99, Trader Joe's) is a red with good QPR. It is made from Rubin grapes, a cross of Nebbiolo and Syrah developed in Bulgaria in 1944. Unfiltered and full of sediment, it was dark garnet in color and full of mouth puckering tannins. In short, this was a wine that benefited from decanting, and would also benefit from some more time in the bottle. I don't bother much with decanting in the normal course of things, though I probably should, but as soon as this went into my glass I thought, "OK, time to bring out the decanter." If you don't have a decanter, a clean jar or pitcher will do. What you are doing is getting some more air in the wine and, in this case, hoping to filter out the sediments by using a wine funnel with a screen on it. FYI, a mesh tea strainer works just as well and you probably have one in the back of the same drawer where you store your corkscrew. If you want to see someone demonstrate decanting, and what it can do for a wine, check out this video from Gary Vaynerchuk of Wine Library TV as he does a decantation! After decanting this wine, the spicy aromas and indefinable black fruits detectable on first opening and sipping the wine gave way to herbal, fruity, and meaty flavors. The aromas and flavors developed along the grilled meat/grilled herb spectrum, with fruit taking a back seat. There were notes of cinnamon on the dry, dry finish. Damianitza is in southwestern Bulgaria near the Greek border in Thrace's Struma River Valley. Founded in 1940 during the height of communist wine-making in the region, it was privatized in 1997. Not surprisingly, privatization has brought both challenges and opportunities to Bulgarian vintners and winemakers, and Damianitza is one of the wineries that is recognized for its efforts to bring the best Bulgarian wine traditions into the 21st century. Wine Report 2007 listed Damianitza among the 10 fastest improving wineries in Eastern Europe, for example. They bottle over 2,000,000 bottles a year, and use native grape varietals like Melnik and Rubin. JohnG over at Quaffability tried their Melnik a little while ago and was less than completely impressed. I'll try to open up my bottle soon and add my tasting notes to the mix. In the meantime, if you want to try this affordable and easy-to-find Bulgarian wine, here are my recommendations for dealing with this young, brawny specimen: 1. decant 2. Serve it with hearty food, like steaks, grilled meat, or any robust fare that's not too spicy because trust me you do not want to accentuate the tannins in this wine. 3. Take your time drinking it and enjoy the way the flavors change with more air and time out of the bottle.